So begins F.W. Murnau’s astonishing film. This is a moving simple story of a husband’s betrayal of his wife with a seductive city girl. Labelled simply ‘The Man’ (George O Brien) and ‘The Wife’ (Janet Gaynor) the protagonists embark on an adventure of temptation, reconciliation, reconsecration and redemption, told with a lyrical simplicity of timelessness and universality. Made with an unlimited budget, the amazing cinematography captures both idyllic rural settings and the bustling modern city with pioneering camera work. 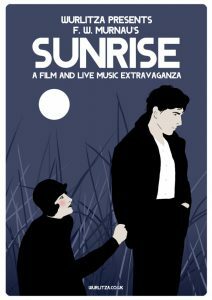 Sunrise is silent film at its most poetic. it uses an amazing array of cinematic touches, with a plot that keeps the audience transfixed. Wurlitza will provide live accompaniment, adding music that will be both familiar and unfamiliar, from Bach and Villa Lobas to Talking Heads, Echo and the Bunnymen, Madness and the Vapors, as well as some of their own. This is a truly unique and memorable experience, and great for all ages.